Nchedo Ezeokoli says she wouldn't have made it to graduation without her adviser, Dee Dee Romo-Nichols. Stanford is just a one hour drive from Nchedo Ezeokoli's hometown, but it felt like a world away. Sitting in her freshman dorm, it was the first time she found herself surrounded by people who were predominantly white and wealthy. She didn't get along with her first roommate. She felt intimidated by her 300-person chemistry class. And although she chose Stanford because it was close by, she rarely made what she calls the "journey" home, which could take nearly three hours by bus and cost $12 one way. Many colleges are making it a priority to attract high-achieving, low-income minority kids like Ezeokoli. They're recruiting at different high schools and growing financial aid programs. President Obama has expanded the federal Pell grant program, which awards money to the poorest students. But getting in and paying tuition are only half the battle. They're often the first in their families to go to college and have a number of emotional, financial and academic hurdles to jump before making it to graduation. Low-income students are less likely to graduate than their peers from more affluent families. There is an average 6% graduation rate gap between students receiving federal Pell grants and those who don't, even when they are enrolled at the same college, according to the Education Trust. Ezeokoli got a full ride to Stanford. She was well-prepared academically and had already earned two associate's degree while in high school. She was accepted to 22 colleges -- including Stanford, Princeton and Harvard. Still, freshman year was tough as she struggled to find friends she could identify with. She's a black woman, an immigrant from Nigeria, and she grew up in a family that struggled to stay above the poverty line in a crime-ridden Oakland neighborhood where a quarter of kids drop out of high school. She seriously considered transferring out freshman year. "I felt in between cultures, in a way. I was just so unhappy and miserable, honestly," Ezeokoli told CNNMoney. But that was five years ago. This week she graduated with a bachelor's degree from Stanford's Science, Technology and Society Program. What turned things around? 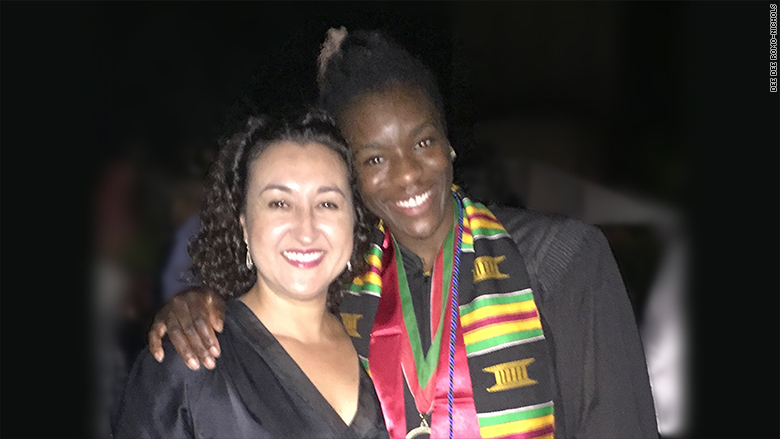 Ezeokoli found a support system in Students Rising Above, a group that helps San Francisco Bay Area kids get into college, graduate, and transition into a career. It provides financial assistance and -- what may be even more beneficial -- an adviser that sticks with them from junior year of high school through their first year out of college. "I wouldn't be here right now without it," Ezeokoli said. "I remember that she was really ready to leave. She called and said she was done with Stanford," recalled Romo-Nichols. It was hard for her to find a friend that she felt comfortable opening up to. She didn't feel like she could even talk with her own twin brother, who was also attending Stanford. With her adviser's encouragement, though, she stuck with it. One of the first places she found people she could connect with was the Nigerian Students Association. Her circle of friends snowballed from there. She eventually joined hip hop and rugby teams and connected with an on-campus academic adviser. SRA helped her find an internship at Columbia University that summer. "Many students we work with at some point feel like they don't deserve to be on campus. We really work with them to keep them moving forward," said Lynne Martin, the Director of SRA. The organization initially gave out scholarships without offering a mentor program. But not even half of the kids ended up graduating from college, said Martin. It's since grown, accepting about 100 high schoolers into the program each year -- all of whom live below or near the poverty line. By matching each student with an on-staff adviser and a volunteer mentor, 90% of them now graduate. And it offers financial assistance beyond the cost of tuition, room and board. If the student needs it, SRA will step in with money for things like participating in clubs, basic necessities like shampoo, dorm-sized bed sheets, a copay for a doctor's visit, maybe an occasional dinner with friends. It helps them get home for winter break and study abroad. Ezeokoli studied abroad in India, Italy and South Africa where she stayed a summer longer to do public health research with the University of Cape Town. She plans to spend the summer on a service trip to Ghana, and then she'll teach English at a medical school in Japan for a year. In 2017, she'll begin Emory University's Master's in Public Health program, where she's already been accepted. Her dream job? To help provide public health and preventative medicine services to under-served communities.